Throughout history, there has been one medium in which men have cared as much about accessorizing as women. That medium is sports. Yes, long before Allen Iverson rocked the unnecessary shooting sleeve and Jim McMahon took douchiness to a new level with his seemingly endless array of headbands, athletes were accessorizing their drab garments. I guess neon spandex and mesh just weren’t enough. Over the years, two ridiculous sports accessories have stood out amongst the rest: rec specs and neck pads. But which one reigns supreme? Let’s explore this question in a battle of ridiculous sports accessories! If you grew up in the ’80s or ’90s, you probably had a friend or a sibling who wore rec specs. That friend or sibling likely used “My glasses broke last time I wore them in a game” as a defense when you inevitably made fun of said spectacles. Rec spec enthusiasts often spent more time defending their eye wear than actually playing sports in them. Rec spec wearers are thick-skinned, an essential quality in an athlete. One point for rec specs. They build character. Moving right along, consider the numerous awesome athletes whose faces have been graced by rec specs. The list is long and dignified, including Eric Dickerson, Kareem Abdul-Jabbar and Kurt Rambis. And let’s not forget about those people in your middle school basketball action photos who sported the specs shame-free. Those people likely also had mullets. Another point for rec specs. When you wear ‘em, you’re in good company. Perhaps even more impressive than the rich history of rec specs is the staying power of these bad boys. Sure, they’ve evolved over time, but rec specs, in some incarnation, are still alive and well in sports. Let’s take Amar’e Soudemire, for instance. Amar’e subscribes to the new school tradition of rec specs. You know, sleek, shiny and fitted. He thinks he’s so cool playing in NYC with his designer sports glasses. Still rec specs. Yet another point for rec specs. Also commonly known as neck rolls or collars, these accessories gave the impression that an athlete was on steroids (which they very well might have been) when they became an epidemic in the ’80s and ’90s. Every white linebacker had to sport neck pads to look bigger and more intimidating. Just ask Brian Bosworth. Large white linebacker without neck roll: child’s play. Large white linebacker with neck roll: psycho ex-girlfriend with a restraining order scary. One point for neck pads. For a while, neck collars became trendy thanks to guys like Brian Cox. Only dudes like Brian could make the Dracula-esque high collars cool. Talent tends to open doors that average people never get to walk through. Other notable neck collar wearers: Pat Fitzgerald and Earl Wilkinson from “The Replacements.” Another point for neck pads, mainly because Earl Wilkinson is a baller. While we’re on the subject of neck pads, rolls, collars and other neck-cessories, let’s discuss the usefulness of said equipment. Who am I kidding? They have no use whatsoever. 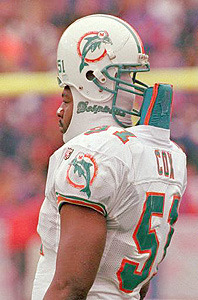 Neck pads are among the most ridiculous, irrelevant sports accessories of all time. I’d put them up there with Power Bands and gold chains (unless you’re Razor Ramon) as the dumbest sports accessories ever. I award neck pads zero points in the third and final round of this battle of sports accessory awesomeness. When it comes to ridiculous sports accessories, rec specs and neck pads are the Keenan and Kel. Neither rec specs nor neck pads are very necessary, but at least rec specs serve a purpose for those who are contact-averse of have chronic dry eye. I wish I could say the same for neck pads, but as evidenced by their recent disappearing act from football stadiums across America, they’re pretty irrelevant. Thus, rec specs are the winner of this particular battle. If you have any doubts about the dominance of rec specs, just take a peep at an ’80s high school yearbook, and you’ll see copious evidence of their superiority. Which ridiculous sports accessory do you think reigns supreme? Holla at us in the comments section or on Twitter @BaconSports to make your voice heard! Business casual by week, sports chic by weekend. Originally from Pittsburgh, Rebecca bleeds Black and Gold and cites Casey Hampton as her all-time favorite Steeler. Warning: do not approach her directly after a Steelers loss.